Clark Park farmer's market attendees purchase produce from vendors on Nov. 19, 2016. The Clark Park farmer’s market offers a uniquely familial community. The market is held every Saturday starting in October from 8 a.m. to 12 p.m. The market takes place outside of the Clark Park community garden, a repurposed community swimming pool on Roosevelt and Broadway Roads. What sets Clark Park farmer’s market apart from other local Saturday markets is its neighborhood feel. For Erin Redman, Tempe resident and assistant research Sustainability professor at ASU, the market has become a weekly family outing. The market aims to provide a number of different activities to attendees. There are food trucks, local vendors, morning yoga and live music every week. A group of students from an ASU programming management class recently organized harvest activities, crafts and games at the market as well. “The market really wants to bring in a group from this specific class every semester — once every couple weeks or so — to bring in more activity to the market,” journalism senior Kendal O’Connor said. O’Connor’s group organized a scavenger hunt for children, as well as a station where kids could color, draw Thanksgiving hand turkeys and make popcorn maracas. Activities like these are what draws in families like Redman’s. The market is firmly based out of the community it’s located in. 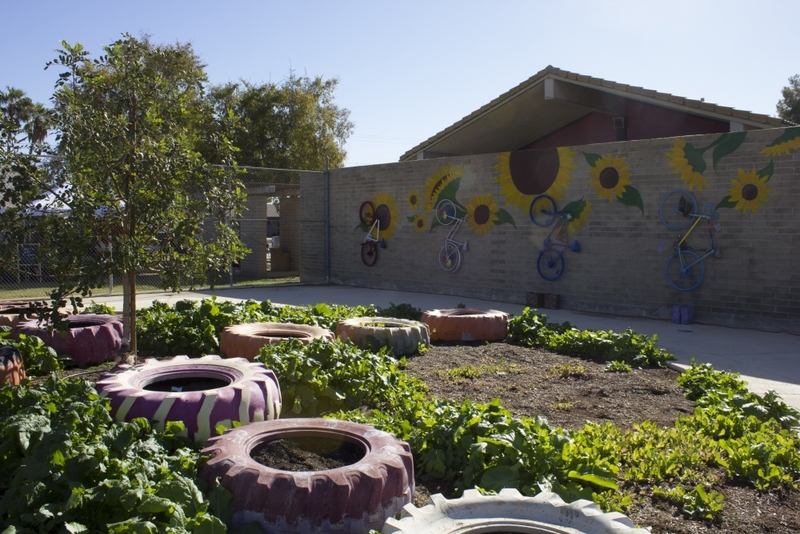 The community garden came as a result of a neighborhood meeting about what to do with the closed swimming pools. Ken Perron lives in the neighborhood and quickly became involved with both the garden and the market. One of the attendees at the meeting suggested a community garden and from there, it became the unanimous goal for the former pools. The neighborhood looked for a sponsor and quickly found out that Tempe Community Action Agency had a garden manager for the community garden at Escalante Park. “We met with him, and we agreed that he could spend some time helping us do our thing, and we’d go under their umbrella,” Perron said. The Tempe Community Action Agency is a non-profit organization that seeks to help disadvantaged members of the community. The Tempe Community Action Agency started a farmer’s market two years ago underneath the bridge at Tempe Town Lake, but chose not to continue with it because of an inability to host consistent events at the location. The neighbors around Clark Park decided to start the market back up outside their community garden. A portion of each vendor’s market profits go back to Tempe Community Action Agency. Perron says he thinks the market’s local beginnings are part of what set it apart from other markets in the Valley. “It’s a neighborhood market," he said. "It’s right in a neighborhood, so neighbors come, walk, ride bikes, so we get a lot more of that kind of activity — repeat customers every week that like to come by and get something to eat, sit and listen to live music." Reach the reporter at cdhenry@asu.edu or follow @carlyhenry_on Twitter.